The Laser Violinist is a stunning virtuoso performing the electric violin, who transports the audience on a musical journey from the classics to iconic movie scores. The Laser Violinist is much more than an instrumentalist. She is a unique act featuring state of the art laser technology. She literally plays her violin with a laser beam and manipulates lasers during her electrifying performance. The Laser Violinist seamlessly combines high technology, thrilling live music and high impact visuals to create a true fusion of music and light. All of the laser violinists available are highly skilled performers having graduated from the world’s leading conservatoires. They have worked with top London orchestras, on West End shows and have performed with artists including Beyonce, Cee-Lo Green, Cheryl Cole, Gnarls Barkley, Gorillaz, Jay-Z, Kanye West, Mark Ronson, Noel Gallagher, Rod Stewart, Dame Shirley Bassey, Simply Red, Take That and The Killers. The Laser Violinist recently played at the Henley Festival where the Duel show performed alongside Sting, Katherine Jenkins, Alfie Boe, Blue, LuLu and Olly Murs as part of a huge laser and firework spectacular. She also supported Leona Lewis at the opening of the Landmark in Hong Kong and supported Jools Holland in London. The girls have performed at Wembley Stadium UK, Fuji Rock festival Japan, Montreaux Jazz festival Switzerland, and appeared on Top of The Pops, X Factor, Jools Holland, MTV, and Live from Abbey Road to name just a few. As well as performing in many countries throughout Europe, The Laser Violinist has taken her show as far afield as Singapore, Hong Kong, the Dominican Republic and Canada. Their strong classical foundations combined with their vast experience of live performance create a compelling, visionary performance like no other! The repertoire ranges from popular classics to iconic movie themes. 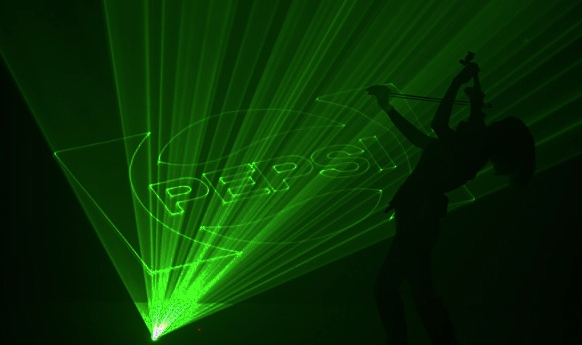 The Laser Violinist can now reveal an Olympic logo in her act for Olympic themed events. She can now be booked to perform her shows with the stunning appearance of the Olympic rings projected in laser together with the London 2012 Logo. They have the ability to produce the logos in full colour, either on a flat projection surface or with our “Bespoke Logo Reveal” which makes the logo appear to float in mid air surrounded by laser beams. Projection sizes from 6m to 30m available. The length of this show can be between 5-12 minutes (5 minutes of lasers). This show is a compact version of the main show. It uses only 1 laser projector, the bow laser, and only 1 technician. The stand has also been made lighter and lower. The length of this show is 5-8 minutes (5 minutes of lasers). 1. The Laser Violinist performs 2-3 exciting new tracks without lasers then goes straight into the main choreographed laser show for an incredibly high impact finish. 2. The Laser Violinist begins with the main choreographed laser show and then performs the 2-3 new tracks with a laser projector(s) behind her doing spectacular effects. (Please note that for this option on foreign bookings we would need the extra laser to be hired in for us). The Cabaret Shows lasts for approx. 15-20 min. IMPORTANT NOTE: The venue must allow the use of hazers, the performance area should be as close to black-out as possible and there should be no reflective surfaces above the performance area. We also have minimum lighting requirements. Please also note that The Laser Violinist can’t work outdoors, particularly, with any sort of breeze the haze won’t be effective. In a marquee if power requirements can be met, the hazers can be used without too much of a draft being present, there is a reasonable height clearance (please see the technical specifications link) and the performance area can be close to blackout then the act will work and, indeed, may be very effective in a darkened marquee.